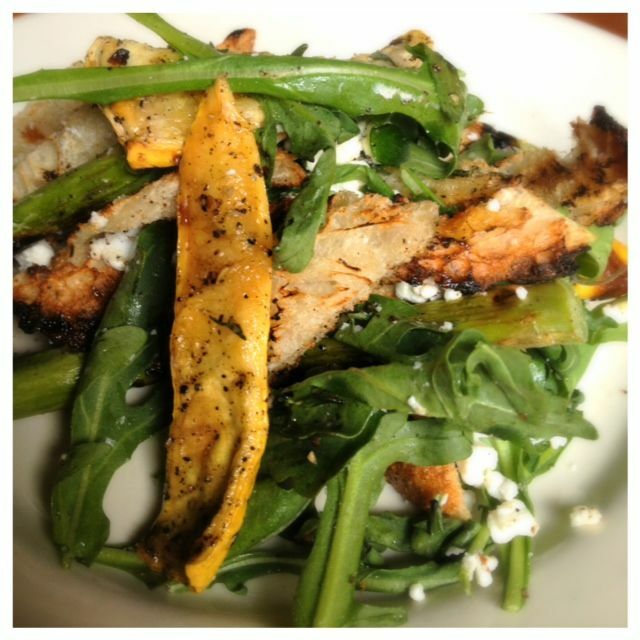 We started with a bread salad with grilled summer squash. It was fantastic. It even had grilled asparagus and and grilled bread. It had a great smokey flavor and served over arugula was a perfect combo. Don’t miss this salad. My husband ordered the soup of the day which was a black bean with chorizo. It wasn’t too spicy, but had great flavor. For dinner he chose the Pork Chop. It was perfectly tender and the polenta had great flavor in it and in the sauce drizzled over it. Luckily my husband doesn’t care for artichokes and I love them, so I didn’t have to fight for them. 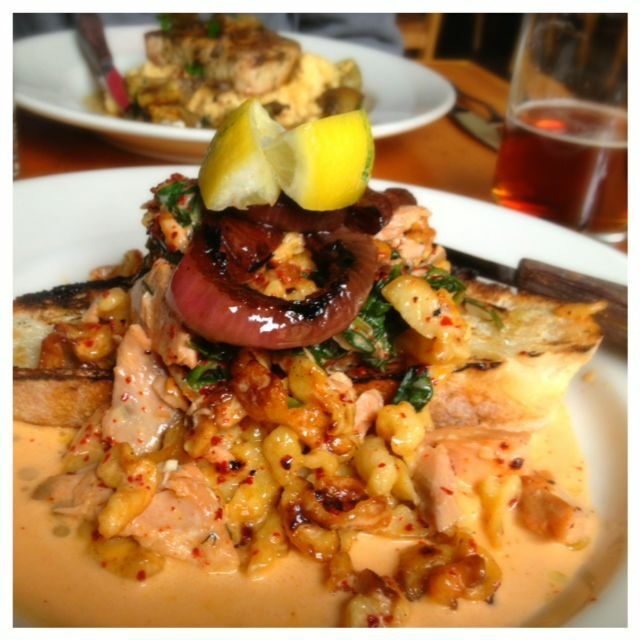 I ordered the smoked salmon over spaetzle. Our server warned us that this was a rich dish. He was not kidding. It was very, very rich. Incredibly tasty and easy to over eat. 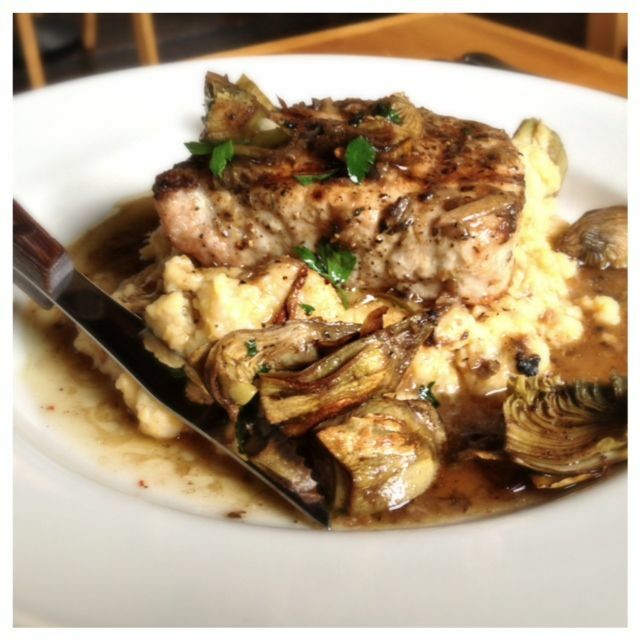 My husband and I both agreed we are glad we shared this dish and we would order it again hands down. This place is so, so good. If we lived closer this would be our local hang out. The chef knows what he’s doing and it’s been perfect both times. If you read my original post below you will see that even though I loved my eggs benedicts it was not a breakfast flavor. They have since changed it because of that very reason. The other thing that was completely different over my original post is that service was incredible. We got tons of attention, the server was very knowledgeable about all the food (which I love) and we never waited for anything. I hadn’t really heard much about Equinox but once I saw a Groupon and checked it out in the Breakfast in Bridetown book, I knew I needed to give it a try. We decided to try the breakfast. There was enough of a Groupon to get one meal and a drink at a discount, so as always, it seems like a great way to try a new place out. I was instantly intrigued by the menu and the fact that they had so many benedicts, especially the Portobello Mushroom Eggs Benedict. Very intrigued. We were seated rather quickly, since the place had not started to fill up yet. We waited for a good 10 minutes before anyone came and took any kind of order. I know that doesn’t sound like a long time, but when the place is barely full and they keep looking at you and you haven’t even ordered drinks you’d think they’d come over well before that. By the time we roped her in for an order we wouldn’t let her go before we ordered the whole meal. Usually at this time I ask all kinds of questions about what’s special to them, anything we shouldn’t miss, how’s the benedicts? You know all my 20 questions. Instead I felt like we were kind of putting her out just getting her attention to come over, so I didn’t ask any questions. While we waited for our food we had to get up and get our own coffee, since no one was giving us any service. 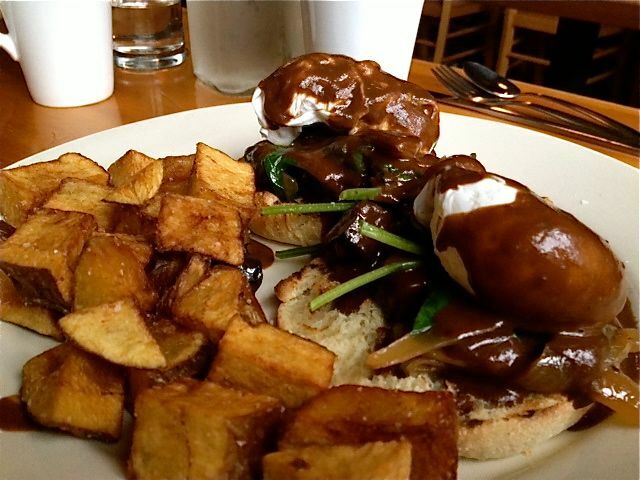 I ordered the Portobello Mushroom Benedict. It came out with a brown sauce. At this point I wish I would have really read the description or at least ask some questions, but here it was. Let me start by saying it was incredibly savory. Great combo of flavors with lots of depth. I really liked it and ate the whole thing. What I didn’t like is that it was not a breakfast dish, but more of a lunch/dinner dish. So yes, it was good, but I wish I would have gone for something a little more traditional, as far as breakfast flavors go. My husband ordered the Smoked Salmon Hash. Wow!! 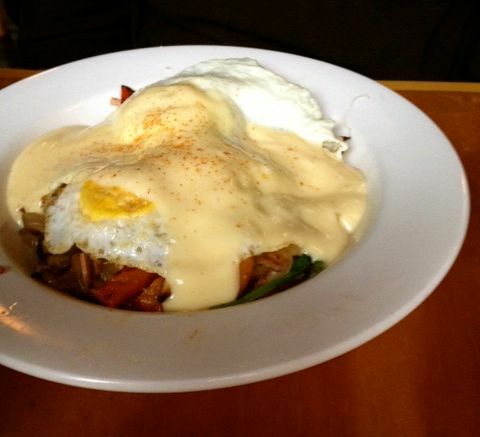 Great, great flavor and it was topped with a hollandaise sauce. I always think hashes need good sauces not just eggs. This one was perfect. Perfect amount of salmon, sauce and eggs. The serving size was a bit on the small side, but it was still perfect. I am still a fan of using Groupon for trying new restaurants and will continue to do so. Atmosphere was fine. It’s good for large groups. It has a huge outdoor seating area, which I would like to try in the summer. Pricing was pretty average. About $10 a plate for brunch, $17 for dinner. They had Tazo tea, which I am not a huge fan of. Coffee was great, but forgot to ask what company it was. I did see they had 6 beers on tap. UPDATE: Great beer selection and awesome cocktails. Service was horrible. I really, really hope that was a fluke, we want to go back. UPDATE : Service was awesome at dinner, actually better than awesome. Equinox is located off of Mississippi Ave. on Shaver. The one time I have been here we had really good service, so hopefully it was just a off-day. I would like to go back because I liked the atmosphere and cocktails. I was really hoping someone say that. I hate to throw the baby out with the bath water on that one. Food was great.